At present, sawdust is treated as special waste by some sawmills, as it cannot be put to good use. In fact, increasing amounts of sawdust piles can even affect production. According to Luke’s Research Scientist Risto Korpinen, sawdust could be part of the solution to the global need for food. Transforming sawdust into fish feed is a complex process. Click the image to open in full size. Image: Ville Kujansuu / MAK Media. It is estimated that by 2050, about two billion more people would need food than today. As the amount of arable land decreases by 600 square meters per person, nutrition scarcity will become more and more common. Simultaneously, Finnish sawmills are generating 3.3 million cubic meters of sawdust per year. Although most of the sawdust is used for producing energy and pulp, a considerable amount of it is piling up, remaining unused and finally becoming rotten. Global hunger and sawdust waste may appear to be two different problems, but according to Korpinen these two can be combined. Currently, Korpinen is heading a project known as MonoCell – High-quality single cell protein for fish feed. The title of the project itself says a lot about its objective: to create high-quality, single-cell protein from sawdust. The protein obtained could then be developed into fish feed. There has been a lot of discussion about the challenges that food production has to face in the future. That is also one of the reasons why I came up with this idea. The concept of using wood as food is not new in Finland. In fact, during the time of famine in the 19th century, Finnish people made bread out of pine bark to survive this period and during the Finnish Civil War in 1918 the same emergency food was also consumed. Obviously, wild fish and soy cannot be continuously fed to the fish bred in fish farms like it is being done today, says Korpinen. Simultaneously, the soy industry is encountering a lot of criticism because soy plantations plays a major role in deforestation and needs plenty of arable land that could otherwise be used for planting food, and not fish feed or animal. Sawdust is a well known material to Korpinen. During his student days at Åbo Akademi University in Turku, Finland, he prepared his master’s thesis about crating cellulose from sawdust. Today, he has a doctoral degree in Science in Technology and believes that sawdust is a perfect raw material for fish feed as it cannot be consumed as such. We could do these same things with potato or corn starch too, but starch can also feed humans. In the US they make bioethanol out of starch, even though there are plenty of people in the world suffering from hunger. It just goes against my morals to use food in fuel production. The MonoCell project was actually started in August when the initial experiments were carried out. Using sawdust to produce protein is an advanced process that involves a number of stages. The aim is to perform the study during the 2017 Autumn. The team includes 10 Researchers from all over Finland. Being the Lead Researcher and performing the initial experiments, Korpinen will be mostly working on the initial stages. The Researchers are familiar with some part of the procedures, which they have already been used in other projects. Everyone in our team has their own task that reflects their expertise. We have food scientists and nutrition experts, for example. At the end, researcher Frans Silvenius will do a life cycle analysis that will tell us how much energy and chemicals have been used in the whole process. 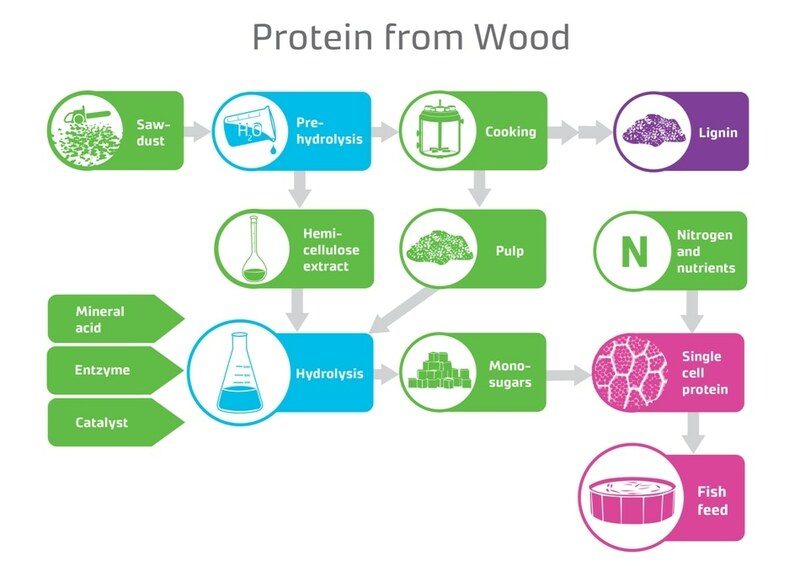 According to Korpinen, wood-based protein has a practical chance of becoming a good alternative for fish feed. Since pulp mills have the right facilities, they can develop and utilize the MonoCell innovation and eventually develop new business for themselves. “Mills could establish protein production units on their properties. They could benefit from the synergy by not just circulating the materials, water and chemicals but also energy, like electricity and steam.” Korpinen says. Moreover, the production of protein would provide a suitable solution to the major problems faced by Finland sawmills. For instance, while sawdust can now be used for making biofuels, the situation is still much more complex. Due to the current energy policies in Finland, sawdust cannot be profitably used as an energy resource. Presently, Finland subsidizes the use of forest chips, which are partially imported as an energy resource. However, domestic sawdust does not figure in these subsidies. As a result, sawdust prices dropped significantly as an energy resource and this trend is the reason why Korpinen is very hopeful about sawmills. Similar to pulp mills, sawmills may boost their profitability by realizing profit from one of their by-products. Moving forward, the future for MonoCell innovation already includes cooperation with an actor who has shown interest in protein production.